sunday’s song – Happy Mother’s Day! In early April, we spotted the familiar white blossom amid the briars that bordered the barbed wire fence. Blackberry season would soon be here. Enthusiastic pickers take note of the location of such things. A few weeks later, that blossom has become a blackened berry ready for the taking. And so we gather the bounty from nature’s first offering. It’s spring at Rock Lake Ranch, and anticipation is in the air. We ready the fields and meticulously tend the tender vines in the garden, but blackberries arrive without the maintenance, without the fuss. In fact, the whole season could slip by unnoticed, had we not cherished memories of blackberry cobblers of years’ past to stir us to action. So many things on a farm require intense work, and even then, there is no guarantee of fruit for the labor. Our fruit orchard is in full bloom and seems hardier for the wear, despite the very harsh winter we sustained. “For that which does not kill us,” as the old saying goes, “only makes us stronger.” It seems nature knows this secret better than any of us. The garden is an ongoing metaphor of life. However, berries are the surprise, the honey, the extra bonus, from the earth which supplies our needs, blessing our lives with the fullness therein. And so, today, we make a blackberry cobbler to celebrate the abundance. This recipe comes from a tradition in my own mother’s kitchen, in honor of her today. I have such fond memories of life long ago, watching my mother strain the berries through a cup towel to extract all the sweet juice without the seeds. After a day where we all picked berries in the hot sun, our Sunday supper would be this blackberry cobbler with a big scoop of Blue Bell homemade vanilla ice cream. Pure deliciousness! Happy Mother’s Day! Combine first 3 ingredients with a fork or a pastry blender to make pastry. Add ice water. Form dough. Wrap in wax paper and chill for 8 hours. When ready to make the cobbler, roll out pastry and cut the dough into strips. Place half the strips on a cookie sheet and bake at 450 degrees for ten minutes, or until crisp. Cover blackberries with water, barely covering. Cook over medium heat until berries are tender. Mash berries through sieve. Add sugar, cornstarch, butter. Bring to a boil. Stir and remove from heat. Grease an 8 1/2 x 9 1/2 inch baking dish. 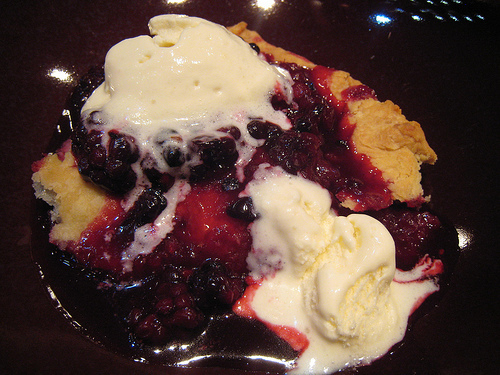 Place half of the blackberry mixture in dish; top with cooked pastry strips. Add remaining blackberry mixture and place uncooked pastry over the top. Brush with beaten egg white and sprinkle with a little sugar. Bake at 375 for 35 minutes or until brown. Serve warm as is or splash with blackberry brandy and top with a scoop of ice cream or whipped cream. This entry was posted in Uncategorized and tagged holidays, recipes by annette g. Bookmark the permalink. Mom was talking about eating more blackberries and dewberries as they picked than what they brought home for cobblers, jellies, and pies.